The Twelve Days of Christmas Swap may have just wrapped up, but I'm already gung ho for another! 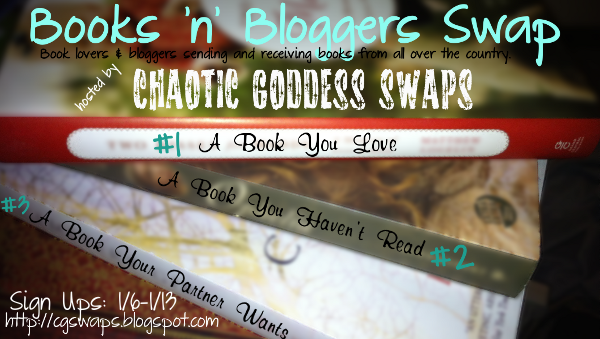 And there ain't no swap like a Chaotic Goddess Swap so when I saw they were hosting the Books n' Bloggers Swap of course I signed up! The premise is simple. You sign up, pair up with your partner and then you send them three books. One book you've read and loved, one book you haven't read, but you think they'll enjoy, and one book they request. Bellman & Black is by Diane Setterfiled, the author of The Thirteenth Tale, which I totally loved in all it's strangeness. Seriously, it was like one of my favorite books. This one does not sound as interesting off the bat, but then again The Thirteenth Tale sat on my book shelf for probably two years, because it didn't "sound" very interesting, and I was very wrong about that. Something Rotten by Jasper Fforde is the fourth book in the "Tuesday Next" series. I've already talked about my love of his books. But, I have a really hard time finding anything by him in used bookstores, thrift shops, and at Bookmooch which is where I get most of my books. I've read the first three books in the series, and stumbled across the sixth somewhere, but I don't want to read it until I've read the fourth and fifth of course. I'm always looking for more book recommendations. Do you have any you think I should be reading? If so, leave me a comment and I'll check them out. And, if you're a book reading blogger, you may want to sign up for this swap! Sign ups close January 14, so hop to it. Beth, at first, I was thinking about sitting this one out, because I have sooo many books already, but I just couldn't resist. 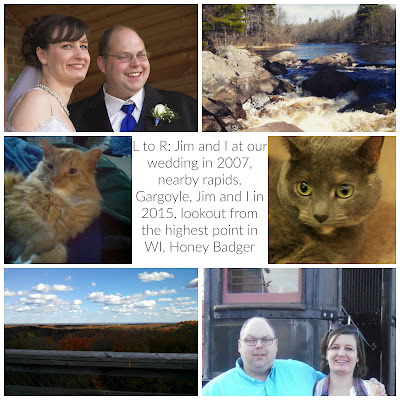 Plus, it's so fun getting packages ready for swap partners! I am just reading the 4th Jasper Fforde now having got it in a charity shop last week. I love The Thirteenth Tale too and can't wait to read her next one. Have you read The Distant Hours by Kate Morton? It is similar in style to 13th tale. I haven't read The Distant Hours, but I checked it out and added it to my book wish list. Looks good! I have The Forgotten Hours by Kate Morton sitting on my bookshelf waiting to be read too.